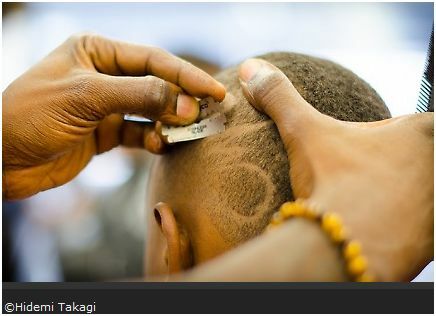 Photographer Hidemi Takagi photographs the barbershop culture in Crown Heights and Bed-Stuy. The idea of barbershops as a social club, a place to debate politics, social issues, sports and family; where young and old all go to catch-up and learn, are sensitively captured in these photos. Featured barbershops include ABC 2 Barber Shop, Nine Hair Studio and De Rite Barbershop. BRIC Biennial:Volume II, Bed-Stuy/Crown Heights Edition, Special Project – The BarbershopsHidemi Takagi has been translating her personal vision of New York into photographs and videos since leaving Japan in 1997. For the Barbershop series, Takagi documents institutions that are central to public life in the Bed-Stuy and Crown Heights barbershops that come under threat from real estate development and rapid gentrification. Fascinated by the culture and concerned for the future of these institutions, Takagi traveled to varied barbershops in her neighborhood where she observed, chatted, and photographed the barbers and their customers, allowing for the character and feel of each shop to come through. No user commented in " The Barbershops by Hidemi Takagi Exhibition "